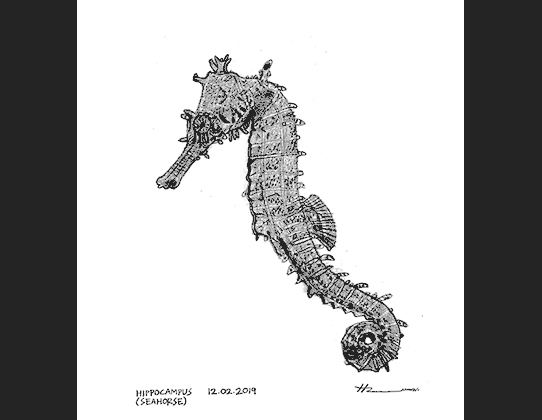 Hanzhen's latest drawing, HIPPOCAMPUS (SEAHORSE), is drawing no. 1181 !! Hanzhen's sketch entitled PAINTED STORK is selected as the icon for Walk For Hope 2018, a public walk mooted by Senibong Cove (a waterfront development by Walker Corporation) to raise fund for autism causes. 9th Walk for Autism at Melaka World Heritage City : Hanzhen's progress in his career has not been possible without the support of Kanner. He will not forget his roots. As per our pledge to give back to the autistic community, Hanzhen is most pleased to donate RM10,000.00 (part of the proceeds from his latest project for the supply of more than 2000 pieces of art prints to two hotels) to Persatuan Kanner Melaka during the walk. Many thanks to Timothy, John, Ken, Brinley, Siti, Ana Marie, Kabir, Kabilan, Niger, Sukesh, Ter Yan, Yuan Jie, & all others in the team! You guys are great! “Closing The Gap” Art Fair & Charity Sale @ Utropolis Marketplace : Opening by YB Puan Dr Daroyah binti Alwi and graced by HRH Queen of Selangor DYMM Tengku Permaisuri Selangor Tengku Permaisuri Norashikin. We would like to extend our heartfelt THANK YOU to NASOM - National Autism Society of Malaysia for the opportunity given to Hanzhen. A big THANK YOU to Paramount Property and the Utropolis Marketplace team for their generosity and support for our special needs kids! Congratulations to all for staging such an amazingly successful event, filled with fun & activities, information for parents... and glamour too! 13 pieces of Hanzhen's artwork were sold. Tshirts & pouch bags were sold out! Part proceeds were donated to Nasom. is a collaboration between Hanzhen Yap (the Artist) & Krittanon Thotsagool from Thailand (the Filmmaker). A beautiful sketch book about crabs in satun thailand . petra national park . tarutao national park + other wildlife sanctuaries . koh lipeh . koh bulon, it also includes a complimentary 30 mins documentary film on Satun Crabs, which reveals many untold stories for the first time!! It is now available in souvenir shops of major resorts in Koh Lipeh and Koh Bulon. Fresh start to a new year! Hanzhen started on a brand new series of drawings - the Putrajaya Buildings! First up is Putrajaya's most distinctive landmark - The beautiful PUTRA MOSQUE! Hanzhen has completed his last drawing for his Melaka Series - a beautiful sketch of JONKER STREET! Check out latest publication on Hanzhen in YP SG (Singapore YellowPages). Malaysia boleh! An awesome article on our own local pool of talented youth!! What an honour that Hanzhen is featured among such great talents. Hanzhen's artwork entitled "Endangered Animals: There's room on the earth for all of us" was awarded "The Special Jury Award" with 9 other artists.Unfortunately Hanzhen was not able to attend the opening ceremony in Wuhan, China due to other commitments. His artwork will be part of the joint art exhibition of the winning entries (from China, Hong Kong. Macau, Korea, Japan, France, Singapore, Malaysia and The Netherlands) to be held until 24 Nov 2017. Hanzhen partnered singaporean savant artist Leong Tung Seng to put up a joint art display for this glamorous event. The contrast between Tung Seng's bold & fiery colours and Hanzhen's superfine pencil strokes became instant conversation subject for the night! It was heart-warming to see all the Kiwanis members looking very smart with Hanzhen's puppy/kitten Tshirts on, paired with sleek formal coat. More than 180 nos of Hanzhen's Tshirts were sold! On top of that, Hanzhen's sketch of Thian Hock Keng Temple was auctioned off at S$1700. What an amazing night with lovely people on a pure altruist mission! Hanzhen is so delighted to be attending Peggy Loh's book launch this morning as he is one of the 10 featured under the "Portraits" section of her new book with the above title. Peggy Loh is a truly amazing writer - as Tan Sri Shahrir said in the foreword "...bringing to our knowledge and interest a glimpse of life and people of Johor Bahru". Her stories, published in The New Straits Times, The Iskandarian and on her blog www.peggyloh.com , are well followed and loved by many. She is also instrumental in encouraging Hanzhen to pursue his interest in documenting the heritage buildings of Johor Bahru. Congratulations, Peggy! Hanzhen appeared on LiteFM Breakfast Show with Steve and Shaz!! .. for a series called SuperHumans where Malaysians with extraordinary skills or abilities are featured. As Steve exclaimed, Hanzhen had had the whole crew's jaws on the floor with his calendar memory skills. "Selamat Hari Raya Aidilfitri 2017"
4000 walkers turned up at A'Famosa in the early morning of 1st May to show strong support for this annual event organised by Persatuan Kanner Melaka (PKM) to raise awareness for autism. This year's theme is "Respect Diversity, Embrace Differences"! Hanzhen was given the honour to present his drawing of Melaka World Heritage City as souvenir to the VVIPs, the Minister of Women, Family & Community Development and the Chief Minister of Melaka. Thank you to all at PKM, for your amazing dedication and hard work in making this event a success and for inviting Hanzhen and team to be a part of your family! Cheers!! A pleasant evening attended by people with big big hearts! Thank you all for your generosity! Thank you Kanner for the opportunity to exhibit Hanzhen's art. This marks Hanzhen's foray into singing!! Amazing feat... in front of a 400pax crowd in a concert hall! So proud of him. Held on 2 April 2017 in recognition of World Autism Awareness Day, this concert was organised by Persatuan Kanner Melaka to raise awareness for their upcoming walk on 1st May. It aimed to promote talents in autism and to recognise importance of siblings involvement. Hanzhen displayed two pieces of artwork during the CPD Talk by Ar. Mumtazah at the new PAM Centre in Bangsar. Hanzhen is back in style for New Year 2017! ...performed superbly on his piano for this function to kickstart the year. It is very interesting how he drew the connection of hands and legs. It does not matter how long is the hand, as long as it reaches the place that he wants to achieve the movement eg. a hug around a friend! The sketches were drawn right to the edge of paper and continue on the same spot onto the other side of page or to the next page. Amazing! It seems like Hanzhen was trying to draw an illustration book. The AnAn International Education Foundation of Hong Kong just held their Autistic Talent Gala of this year. Hanzhen with his piano skills, along with Chia Loke Yen, a talented autistic singer, formed a group called The Cornerstone to participate - and managed to enter the finals! The 15 finalists gathered at Heung Yee Kuk Building in Hong Kong to showcase their talent. Hanzhen's Endangered Animals Mural for Shell's 125th Anniversary is up!! Location: KRSB Maju Enterprise, Shell Dungun 2, Dungun, Terengganu. Endangered Animals : "There's room on the earth for all of us"
It was a night of AMAZING performance put up by the participants and SEAMLESS support rendered by all those working tirelessly behind the scenes!! Thank you to Careheart for the foresight and belief in these special needs individuals. Thank you to Mr Koh for your unrelenting and unwavering determination in moving the project to fruition. Thank you to all our friends (especially the teachers from Sri Ara Schools) for coming to support Hanzhen at the Kiwanis Careheart Musical Night! Special thanks to Loke Yen and entourage for coming all the way from Melaka to grace the event! Superb performance by Loke Yen, Marivic and Rose - unforgettable! Catch Hanzhen in this special interview with Juice! Hanzhen's Timeline Mural for Shell's 125th Anniversary is up!! Young fashion designer student, Qilin, from Raffles University Iskandar drew inspiration from Hanzhen's art in her latest collection Mitsuki. Check out today's NST Life&Times for feature story on Hanzhen by Peggy Loh! Hanzhen is participating in a musical talent search called "Autistic Talent Gala 2016". Online voting is now on till 7 Sept. If he gets in, the finals will be in HongKong. Hanzhen also joins forces with Chia Loke Yen, an excellent autistic singer from Melaka, to form "The Cornerstone" to belt out Elton John's classic Lion King number. Pls vote for Hanzhen and Loke Yen in the links below! Celebrating 125 Years Through Art is an art project involving 8 artists and 15 murals at selected Shell stations nationwide. The art captures the artists’ own interpretation of progress and the Malaysian pioneering spirit. Hanzhen posed next to the legendary cartoonist Datuk Lat at the media launch on 3rd Aug in Publika Concourse, KL! The exhibition will be on till 7th Aug.
Hanzhen's submission of his early works (done in 2005 when he was 6 years old), a series of colour pencil sketches entitled "The Balloons + The Solar System" won the hearts of many in Tokyo! at My Library, Sutera Mall. Courtesy visit by the Consul-General of Singapore in JB on 13.07.16. Crab, crabs, crabs!! Hanzhen went on a study trip to Satun, Thailand for his planned new book, which will be all about crabs. Hanzhen's new flowers collection - watercolour wash on pencil sketch : reproduced on badges for the International Day 2016 at Austin Heights International & Private Schools. Lost Animal Souls Shelter (LASS) : This fund raising community project to help build a quarantine room for the doggies was initiated by students from Taylors University. Hanzhen lends a hand in this noble project by contributing the use of his adorable dogs and puppies sketches as artwork for the tote bags which were on sale throughout the weekend at Desa Park City and One Utama. Johor Bahru Writers and Readers Festival 2016 : Joint Art Exhibition by 7 local artists, with Hanzhen being he youngest! Looking cheekily handsome at the press conference, he stands tall on his own right as an artist! Check out Hanzhen's interview on Special Children's Art Display website. Kuching . Legacy of the White Rajahs : Book Launch + Art Exhibition. Thank you to all our friends at PAM Sarawak Chapter and Chinahouse@Old Courthouse! Hanzhen is featured in The Borneo Post Seeds, 6 April 2016, “Legacy of the White Rajah through a savant's eyes” by Patricia Hului. Initiated and supported by the Malaysian Institute of Architects Sarawak Chapter and developed by Galeri Hanzhen, this book project features a collation of 24 sketches of the historical buildings of Kuching by Hanzhen. Check out Hanzhen's new video! Hanzhen started off the year 2016 with the completion of his drawing for the High Commission of the Republic of Singapore in Kuala Lumpur. Birds of Malaysia Series : 12 of Hanzhen's sketches from this series were selected by Era Universe to adorn their corporate calendar pages for 2016. Hanzhen participated in the 2015 ParaArt Exhibition in Kagoshima, Japan. World Architecture Day 2015 : Hanzhen's sketches of JB old builldings were on display during the annual dinner of the Malaysian Institute of Architects Southern Chapter. Hanzhen participated in the art auction to raise fund for Soroptimist International Johor Bahru during their annual dinner 2015. Art wall at Oriental Melaka Straits Medical Centre – Showcase Display. Opening of Mini Art Gallery, Persatuan Kanner Melaka. Hanzhen represented Malaysia in this international art exhibition which saw participation from countries all over the world. Walk For Hope at Senibong Cove garnered participation from 1200 walkers! Meet & Share : Nurturing Autistic (Gifted) Youngsters at One+Another Cafe, Setia Alam Club. A talk centred on Hanzhen recently charts his development in his sketching progression. It was entitled "The Box Of Short Pencils". It tells the story of how good habitual routines had helped Hanzhen to build an astoundingly vast collection of sketches. Each sketch is meticulously drawn to perfection. With each sketch he perfects the proportions and depth. Each stroke is more confident. And each drawing makes a collection. The moderator went on to say that most of us would surely benefit from routines. Practice makes perfect! Lend your support! Walk for Hope! An upcoming event, a 3.5km walk covering parks and boardwalk in Senibong Cove, is one that will feature a specially designed T-shirt printed with Hanzhen's art. All proceeds will be donated to Kiwanis Hope Garden. Call organiser Senibong Cove at +607-382 0388 to register. See you there! One+Another Cafe at Setia Alam Club: A simple art installation showcasing some of Hanzhen's best works will be on display for two months. Johor Architectural Sketches Exhibition (JASE) : Organised by students of the Raffles University Iskandar and held at EhHe, right at the heart of heritage JB, this exhibition "is dedicated to promoting the local architecture and some of the cultures of Johor Bahru through the perspectives of two local artists - Buz Walker and Hanzhen Yap... the love and passion of both artists towards art and Johor Bahru heritage are depicted through their detailed sketches. This is an opportunity to showcase Johor Bahru's heritage from two distinctly different generations of artists"
Hanzhen has just published a fresh & exciting new book, "Dogs+Puppies . My Pet, My Best Friend". It was introduced to the general public during a Gala Charity Dinner & Dance on 15.08.15 organised by SPCA Melaka and Rotary Club of Kota Melaka. It features 20 beautiful pencil sketches by Hanzhen and is accompanied by informative and rather comical text by his prolific brother, Zhihan. 50% of all proceeds from the sale of books during this charity event was donated in support of The Society for the Prevention of Cruelty to Animals (SPCA)!! Hanzhen received a Certificate of Appreciation from Kiwanis International, specially flown in from America, during the Kiwanis Careheart charity dinner for his contribution towards the Eliminate Maternal/Neonatal Tetanus Project. His artwork was auctioned off at the 99th Kiwanis International Convention in Tokyo last year for a cool USD2000 to an American delegate and the proceeds went to this noble cause. Film crew from Bangkok arrived here in JB to shoot a documentary film on Hanzhen. They will be here for two weeks to capture moments of Hanzhen's life as an artist and an autist! Main director is Monsak Chaiveeradech. He is a lecturer in Thammasat University. His co-producer is Uruphong Raksasad whose documentary film was shown at the Rotterdam International Film Festival (2009 Unesco Award). A Day Art Exhibition showcasing selected pieces of Hanzhen's signatory sketches was held during the property promotional event at Uptown Residences Sales Gallery, Damansara, KL, organised by Group MAD. Hanzhen confidently played prefunction music on his digital piano for the esteemed guests. 50% of all sale proceeds was donated to a nominated charitable organisation in support of autism cause. 6th Walk for Autism at Melaka World Heritage City : Hanzhen led 1000 walkers in the historical town of Melaka in the early morning of 1st May. Let’s WALK to show we care. Let’s WALK to support our community. LET’S WALK ....TO MAKE A DIFFERENCE!" ...was part of Hanzhen's speech when he declared open “6th Walk for Autism 2015 at Melaka World Heritage City”. 6th Walk for Autism at Melaka World Heritage City : Preparation are in full swing for this event, to be flagged off in front of A'Famosa on 1 May 2015. It is an annual event organised by Persatuan Kanner Melaka. In line with this year's slogan "DIFFERENT NOT LESS", Hanzhen has been invited to be the guest of honour! Hanzhen draws Kuching! In preparation for his new sketch book, Hanzhen visited old Kuching town on a study tour of the local historical buildings, where he experienced many a splendid architecture, professionally guided by Ar Mike Boon and Ar Ng Chee Wee of the Malaysian Institute of Architects, Sarawak Chapter. "Johor Bahru . My City . My Heritage " is now available at selected outlets : Craft Addict @ Senai Airport, JB Chinese Heritage Museum, JARO, EhHe Concept Store and Cove Market @ Senibong Marina. Vatican City, Rome: Private commission. "...His dedication and talent have given hope and inspiration to many, but especially those who have or care for those living with special needs. All of the proceeds from this item will go to fund maker spaces at Concordia, where students can express themselves creatively whatever their interests as Hanzhen continues to do with his drawings." Following his return from his holidays in December, Hanzhen has embarked on a new series of sketches...Sydney! Check out his gallery link on this page! "For Hanzhen, life is in the detail" : Catch Hanzhen in a special email interview as he shares his thoughts with Louise Kinross, editor for Bloom, a magazine on parenting children with disablities, Toronto, Canada. Look out for Hanzhen's Art at The Bold Lab if you are in Kota Bharu! It is a semi-art gallery café in KB which features an art wall called #sapotlocal, a charitable/non-profit initiative by The Bold Lab, showcasing artwork sourced from local artists, painters, photographers and illustrators. 30% of all proceeds will be donated to local charity organizations in need. Hanzhen is featured in Autism Speaks, USA.! Story on Hanzhen in Straits Times Asia and My Paper Singapore. A special feature article on Hanzhen in The Star by Revathi Murugappan. This short exhibition displays some exceptional pieces of artworks by Japanese artists Kuwano Megumi, Ito Kenshi, Kubo Takahiro, Aida Hiroki, Homma Chiho, Nanaumi Shinji and Malaysian Hanzhen! Hanzhen participated in the Commemoration Exhibition of Incheon 2014 Asian Para Games "Drawing The Light Of Hope" organised by the Korean Art Association which was held in Incheon, Korea. Catch Hanzhen in the October issue of Airasia's inflight magazine as he "shares his aspirations and passions for art" with Travel3sixty's Jetsetter columnist Chitra Santhinathan (pg 134+136). REAL! Gallery @ Regency Specialist Hospital : Hanzhen is holding a solo exhibition entitled "The Artistic Genius" for a month at the Real! Gallery of Regency Specialist Hospital. The opening of this exhibition was held in conjunction with the community event for World Heart Day on 27.09.14, officiated by YB Puan Hajah Normala binti Abdul Samad. Sri Ara Schools Charity Fund Raiser : Fun galore at Hanzhen's school funfair! Besides the "ooh"s and "aah"s from his friends and teachers, Hanzhen's art display also caught the attention of the VIP who stopped by to pen a few inspirational words for Hanzhen on the guest book. Hanzhen's sketch of Meiji Jingu was exhibited at the Asia ParaArt Exhibition 2014 held at Tottori Prefecture Art Space Gallery, Japan. "International Conference on Autism, ADHD & Developmental Disorders – A Biomedical Approach” : Hanzhen's works on Melaka and JB buildings were displayed during the conference to showcase the wonderful capability of an autistic person. This exhibition held at the Melaka Ramada Plaza Hotel on 23-24 August 2014 was made possible by The Great Plains Laboratory Inc and Spectrum Wellness S/B in support of Persatuan Kanner Melaka. During this event, Hanzhen confidently played prefunction music on the grand piano...capturing the hearts of the ladies in the audience with his rendition of "Yue Liang Dai Biao Wo De Xin" (in English "The Moon Represents My Heart"), a traditional chinese love song! Kiwanis Charity Dinner 2014 : Hanzhen presented his elephant drawing "Loxodonta Africana" to philanthropist Mr Chang during the charity dinner, in appreciation of Mr Chang's generous contribution and continuous support. Kiwanis 99th International Convention, Tokyo 2014: Hanzhen's sketch was auctioned off in this international convention held in Tokyo for a cool USD2000 to an American delegate. Johor Bahru Skyline and Causeway : Today marks a milestone for Hanzhen as he completed a commission for the Consul-General of Singapore in JB... a full skyline sketch with the same patient detailing and depth of content that has become his signature style! My City . My Heritage : Hanzhen has started work on his new book, a coffee-table edition with a collation of his sketches of JB old buildings, which will serve as a documentary record of our local built heritage. It will include a Johor Bahru map marking locations of these old buildings...a walk trail of the city for locals, students and tourists alike. Japan Tottori ParaArt Exhibition 2014 : Hanzhen is invited to exhibit his sketch of Meiji Jingu at this international art exhibition to be held at Tottori Prefecture Art Space Gallery from 5.9.14 to 21.9.14. DoubleTree by Hilton, Johor Bahru : Hanzhen's 101 pieces of art installation at this new hotel in Johor Bahru is completed!... in good time for the operation test run before the grand opening of the hotel on 1st of July. JARO Heritage Bazaar : Hanzhen set up a modest stall during this event in JARO to sell prints of his sketches of JB Buildings and Kettles Series. Part of the proceeds was donated to JARO, a rehabilitation centre for the disabled. Preparatory work for Hanzhen's art installation in the new Hilton DoubleTree Hotel in Johor Bahru has started in full force. Hanzhen staged a solo art exhibition during the "Renal Pathology Update 2014" conference hosted by Monash University Sunway Campus on 4-5 April. Keyboard Performance: Hanzhen performed his favourite songs in the Daiman's Annual Dinner function at Pekin Restaurant. Kiwanis Singapore Delta Chapter's fund raising dinner was a huge success! Hanzhen's Thian Hock Keng Temple was sold in a silent auction and the proceeds go to Kiwanis Singapore for their future projects with children of special needs. Hanzhen has completed his fine pencil sketch of the historical Thian Hock Keng Temple in Singapore. This temple was gazetted as a national monument in 1973. This articulated sketch is to be auctioned during the Kiwanis Singapore Delta Chapter's fund raising dinner on 7th of March at the Goodwood Park Hotel. A story on Hanzhen from his mother's perspective is published by China Press in their Spring Breeze magazine Vol 1/2014. Hanzhen exhibited 90 pieces of his artwork during the gala charity dinner hosted by the Kiwanis Hope Garden in Renaissance Hotel, JB. Among the distinguished guests are members of the Lamborghini Club Singapore, who graced the event with 12 nos of their prestige cars on display. Funds raised from various generous donors during the dinner will go towards the building of a school for training of autistic children. Art Therapy : An article on Hanzhen and his works is published in Architecture Malaysia Vol 25 Issue 6. Kiwanis Careheart Centre officially opens its new Kiwanis International Art Gallery with an impressive collection of art pieces by disabled artists from all over Asia. Hanzhen is the guest of honour and cut the ribbons to officiate the opening! Hanzhen in Tokyo! Hanzhen's sketch of the historical Cheng Hoon Teng Temple in Melaka is one of the winning entries in the Asia ParaArt Tokyo 2013 competition. Hanzhen was also invited as a special guest to share his experience in the symposium. Check out https://www.facebook.com/asia.paraart. His winning entry is currently on a travelling exhibition at various airport locations in Japan together with other Asian artists. Hanzhen's school is having a “Charity Fund Raiser” event on 14.09.13. Hanzhen will be staging an art exhibition to raise fund for the needy. Come & support Hanzhen! At the same time have lots of fun with glorious food and challenging games. Hanzhen's sketch of the Cheng Hoon Teng Temple in Melaka has been selected for the 2013 Asia Para Art Exhibition in Tokyo! Entitled "Art Goes Beyond Borders and Disabilities", the exhibition is scheduled to be held from 9 -13 Oct 2013. Melaka World Heritage Celebration: Hanzhen will be showcasing some of his latest heritage building sketches in an exhibition for the event! Cub18teens showroom, Mt Austin, JB: A print of Hanzhen's "Horse 3" measuring 594x841 in black timber frame is showcased in the new showroom. Hilton Double Tree Hotel: Hanzhen has been commissioned for sketches of old buildings for the new Hilton Double Tree Hotel in JB. Keyboard Performance: Hanzhen performed his favourite songs in the Erawish's Annual Dinner Function in The Grand Straits View Restaurant. Among others, the songs include Canon, Pirates of the Caribbean, Musetta's waltz and Fur Elise. Rocky's Twenty- Hanzhen is showcasing 20 pieces of his favourite sketches on a special wall in Rocky's Steakhouse Cafe in Taman Pelangi. Interested patrons will be able to purchase and part of the proceeds will go to autism awareness. Hanzhen's "Save The Rhinos & Other Endangered Species" exhibtion is displayed during the Johor Interior Designers' Association function at the Blue Wave Hotel, JB where celebrity talkhost Eric Leong is one of the guest speakers. World Architecture Day 2012 : Hanzhen's sketches of Xiaozhou gateways are on exhibit at the newly refurbished main lobby of Landmark Towers, JB. World Architecture Day 2012 - Exhibition by Malaysian Institute of Architects at the Glulam Gallery from 23 to 24 Oct 2012: Hanzhen's 20 fine sketches of centuries-old Xiaozhou gateways are on exhibit for the first time as a tribute to architectural heritage documentation and autism art. Magnificient Twenty Nine @thestraitsview residences: 29 selected Hanzhen's sketches of birds, fishes and mammals are erected as a permanant collection and display at the newly completed clubhouse. The clubhouse is a finalist in the Malaysian Institute of Architects awards 2013. Commissioned by BRDB and Tay Hup Brothers. Hanzhen has started on a new series of sketches, documenting all the different types of "wau"s (kites of malaysia) in his own unique style!! VIew them at "my gallery" link. Today is Hanzhen's first art show outside his hometown! Entitled "Save The Rhinos & Other Endangered Species", it is part of the display organised by Kiwanis Singapore Delta Chapter during their annual fund raising dinner at Goodwood Park Hotel. All proceeds go to Kiwanis Singapore for their future projects with children of special needs. Selected pieces of Hanzhen's sketches are on display for a month in JIDA's "Green House" at Sutera Mall. This is in conjunction with the current "EM & ME" exhibition and later with the launching ceremony of the new JIDA magazine on 28.07.12. Please come and show your support for Hanzhen! Hanzhen's art show entitled "Kettles Reflections" was held on 17 June 2012 in conjunction with the Kiwanis Club of Taman Sentosa's Charity Dinner at Restoran Pekin Sutera. Proceeds raised from the sale of Hanzhen's original sketches through an auction goes to contribute towards the operations of "Kiwanis Careheart"- a training centre for intellectually challenged young adults. Hanzhen has embarked on a new series of sketches.. simply anything on kettles...old, new, shiny or broken... Check out his gallery link on this page! Sri Ara School's fun fair: Hanzhen set up stall to sell his tigers collection. This time he has t-shirts and button badges of his favourite "butterfly" for sale. 12 of his tigers sketches and the whole collection of t-shirts were sold out within the day! All proceeds were contributed to the school fund. Sketching The River Biodiversity: JIDA publishes a story on Hanzhen and his work on the flora and fauna of the river biodiversity. "Stop the slaughter!"... a pleading cry to educate an indifferent society to help save our endangered tigers ... is the theme of Hanzhen's art exhibition held at the Grand Paragon Hotel, JB for 4 days from 22 March 2012. This is in conjunction with The Rotary Club of Johor Bahru's event, "22nd Rotary International District 3310 PETs and Assembly". It is hope that a better public awareness in autism is achieved through the skills of an autist. Hanzhen's latest series of sketches entitled "River Biodiversity" is on display from 4 February 2012 at the clubhouse of Senibong Cove, a new waterfront housing development. This series documents his study of the flora and fauna of river-mouth mangrove which compliments Senibong Cove's plan to embark on a mangrove regeneration programme. This exhibition is made possible by Front Concept Sdn Bhd and Walker Corporation Pty Ltd, as part of their Corporate Social Responsibilities (CSR) programmes. Hanzhen is now a member of the “Asian Rhino Project” ( http://www.asianrhinos.org.au/ ). He hopes to raise sufficient fund from his artwork to enable him to adopt a rhino soon!! "Save The Rhinos & Other Endangered Species" is the title of Hanzhen's recent art exhibition, held on 6 January 2012 at the Johor Cultural & Sports Club (JCSC) Annual Dinner and Dance. 3 pencil sketches of Hanzhen's rendition of the critically endangered rhinoceroses were auctioned. Part of sales proceeds from this event were channelled to JCSC's CSR Programmes. River Biodiversity: Hanzhen has completed his latest project; that is to sketch the flora and fauna of rivermouth mangrove. The sketches draw the special attention to details that Hanzhen has on these subjects. This is timely, considering that our natural habitat is fast depleting. Hanzhen visits Xiaozhou Art Village in Guangzhou: Fascinated by the artistic commune, Hanzhen will embark on sketching the many domestic gateways of olden and modern China. Hanzhen had a reunion and birthday get together with his old school pals Tunku Aishah, Ashvini and Yuvan at his residence at Aloha Towers. They had a custom t-shirt printed in-situ each from Hanzhen's iconic butterfly sketch. Hanzhen's exhibition of his original sketches is being held at the Leisure Farm's Gallery, Johor Bahru from 17.09.11- courtesy of Leisure Farm Corporation and Mulpha International. He has 46 orginal sketch pieces on display entitled "Of Obedience, Solitude and Beauty"
Hanzhen's framed original sketches goes on display in a permanant location at the Kiwanis Careheart Centre. Hanzhen's first art display "Of Routine, Memory and Details" during the Kiwanis Charity Dinner at Pekin Sutera was a huge success. Hanzhen had to part with 40 pieces of his favourite original artwork within a night! A big thank you to all those who had appreciated Hanzhen's art and who had contributed generously. Total proceeds from this promotion were donated to Kiwanis Careheart Centre, in support of autism awareness. Hanzhen's website spotted a new look!